Note: Indiana University East School of Nursing and Health Sciences is preparing highly-qualified nurses for today’s healthcare professions. This is the final story in a four-part series to feature how today’s faculty and alumni are working with nursing students to prepare for the future. Read the series online at http://www.iue.edu/nursingtech. 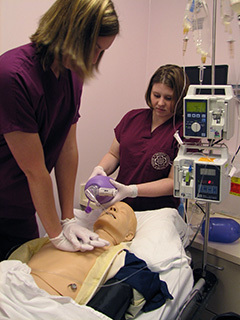 Nursing education is utilizing more technology such as simulation, robotics and other advancements, and IU East’s School of Nursing and Health Sciences has continued evolving to meet the needs of patients and employers. The School of Nursing and Health Sciences provides hands-on opportunities for nursing students to learn and develop skills. The Quigg Family Foundation Nursing Laboratory and the Reid Health Simulation Lab provides an up-to-date clinical learning laboratory using the latest technology, including SimMan, a universal patient simulator that reflects real-life clinical situations. IU East School of Nursing and Health Sciences Dean Karen Clark says IU East has been on the cutting edge of simulation use in its school for some time. Earlier this year, in collaboration with Boise State University, IU East engaged in research related to the use of virtual reality and clinical nursing education. A virtual reality lab is being developed this summer. Don Day Jr., DNP, MSNL, RN, said IU East has always had a very innovative staff who were able to create a real-life Intensive Care Unit (ICU) setting by using everyday nursing items, and they were able to use an interactive method to help students understand and demonstrate competency prior to leaving the program. Day is formerly the chief nursing officer and vice president of Patient Care Services for Fayette Regional Health System, and will soon begin a new position as the senior director of clinical operations with St. Jude in Memphis, Tennessee. Today, Day said they have the advantage of having simulation equipment that helps the student learn in the moment and the situations change from minute to minute, just like the clinical setting. Amber Huelskamp, a 2018 B.S.N. graduate who now works at IU Health Ball Memorial, said IU East has done a tremendous job at improving simulations and making them as real-world as possible with the technology and patient scenarios. “My instructors were innovative within the classroom to assist in our learning, and aid in our own ability to teach our patients by reversing the classroom,” Huelskamp said. Tyler Evans, who earned a B.S.N. in 2013 and an M.S.N. in 2016 and works at Reid Health, said the technology he used in school was very similar to what is being used at the bedside today. Evans said the technology he used in school was very similar to what is being used at the bedside today. Rachel Rose, who earned her B.S.N. in 2011 and M.S.N. in 2016 and now works as a traveling nurse, said IU East is very innovative in its instruction. She said the Sim lab is a wonderful tool that is not available everywhere and she’s glad to know it has been enhanced since she graduated. She said she wishes the lab was as wonderful when she was in school, and current students should count it as a blessing. “Nursing is still a profession that incorporates a lot of technology but really relies on the human connection, and human touch, and IU East was great at balancing the use of technology and the use of tried and true nursing skills such as care and compassion,” Rose said. While diagnosing and treating health conditions is important, today’s nurses also need to inspire patients to focus on preventive care and manage their chronic conditions before they require more complex treatment. The nursing profession is seeing a movement toward population health that aims to increase the overall health of communities and states. An increased responsibility has been placed on individual wellness. Clark said by 2020, at least 40 percent of nursing jobs will be outside of the hospital/acute care setting. The Institute of Medicine (IOM) report in 2010 indicated that by 2020, 80 percent of nurses nationwide should be prepared at the B.S.N. or higher levels to meet the increasingly complex role of nurses. The IOM also stressed that nurses should function at the top of the scope of their license. To meet Americans’ increasing healthcare needs, universities such as IU East are providing more advanced education to students as they earn bachelor’s or advanced degrees. In recent years, more nurse practitioners are serving as primary care providers. IU East is meeting the Whitewater Valley’s needs by developing a nurse practitioner program. And, IU East’s B.S.N. program is in the process of implementing a new concept-based curriculum. This curriculum focuses on conceptual learning and the use of exemplars to better prepare its students. Clark said IU East is holding its students to a higher standard of performance to make sure they are prepared for the complex, ever-changing health care system and the roles they will play. “We are enhancing our curriculum so that our students can provide excellent care in acute care but also in the community, working with populations, promoting healthy lifestyles and wellness, and managing chronic disease in ways that promote better health outcomes,” Clark said. For example, it’s more cost effective to keep health conditions under good control than it is to bring them into the hospital. Using a care coordinator or case manager to promote good diabetic control is more cost effective and ultimately better for the patient, Clark said, than to bring them into the hospital with a blood sugar of 600, increased susceptibility to infection or possible amputation of a toe. Partners such as Reid Health, Fayette Regional, Henry County Hospital, Good Samaritan, regional extended care facilities and other providers are relying on IU East to produce nursing graduates who are prepared to enter the workforce and meet these increased challenges. Clark says there’s been an increased effort to engage students in learning, increase the use of simulation, and to develop a nurse who is better prepared to meet the health care needs of society. “Overall, our goal is to promote sound educational opportunities to positively impact the health of east central Indiana, west central Ohio, and beyond,” Clark said. This is the last story in the four-part series published this month. The full series is available online.